The class time will be a period between 20 - 50 minutes long when the children gather in age groups. At Chapel Hill's VBS, the teachers will have about 30 minutes. Classes are: Circle K's (Kindergarten - Ages 4 -5); Lazy J's (Grades 1-3 - Ages 6-8) and Bar H's (Grades 4-6 - Ages 9-12). Handouts (underdevelopment) are Issues of The Cowtown News. In frontier newspaper form, the front page has "stories" about the events in the Melodrama, and the daily memory verse. Back sides are available for your own classes' specific materials. 1. To connect with the children's "needs" in regard to each day's "troubles". Among the many "troubles" we will seek to identify feelings and needs related to Fears (Day 1); Jealousy (Day 2); Uncertainty (Day 3); Anger and revenge (Day 4) and Discouragement (Day 5). This may be done with an activity, or perhaps by recalling an experience in the teacher's (or the teacher's children's) childhood where similar feelings and needs became tangible. While we experience these at any age, younger children may not be able to express or put such in words, but the teacher should try to draw them out into expressing the needs in their own lives and friendships. 2. To present in simple form the Daily Bible story, appropriate to the age of the class. While telling the story with an open Bible, so the children know it is a Bible story; don't just read it. Narrate it simply, highlighting the feelings of the characters, the troubles and problems they experienced, and the deliverance God provided. The stories will require simplifying especially for the younger children. Aids such as pictures may be used. 3. To focus briefly on the memory verse for the day. 4. To do an exercise or activity that applying the Biblical qualities that meet these needs to the lives of the children, and any individual needs they have brought up in connecting with their troubles. The qualities are: Courage (Day 1), Loyalty (Day 2); Trust in God's Word (Day 3); Mercy (Day 4) and God's Faithfulness - Salvation (Day 5). To prepare for teaching; each teacher should become familiar with the stories of David's conflicts with Saul contained in 1 Samuel 15 - 31. (See my Interpretive Outline of 1 Samuel 9 - 2 Samuel 5 for more help in developing these Bible stories.) I get frequent requests for written Bible stories and lessons, but I think the teachers will profit greatly from developing their own tailored to their particular classes and age groups. Reading David's Psalms, which were written during these experiences, will also help the teacher comprehend his sense of troubles and God's provisions for his children both in and in overcoming them. 1 For the director of music. To the tune of "Do Not Destroy." Of David. A miktam. When Saul had sent men to watch David's house in order to kill him. 1 For the director of music. To the tune of "A Dove on Distant Oaks." Of David. A miktam. When the Philistines had seized him in Gath. 1 Of David. When he pretended to be insane before Abimelech, who drove him away, and he left. 1 For the director of music. A maskil of David. When Doeg the Edomite had gone to Saul and told him: "David has gone to the house of Ahimelech." 1 For the director of music. With stringed instruments. A maskil of David. When the Ziphites had gone to Saul and said, "Is not David hiding among us?" 1 A maskil of David. When he was in the cave. (of Engedi) A prayer. It is also suggested that Psalm 27 and Psalm 31 could have been written during this period in David's life, though the Psalms' titles don't specifically state such. Take note in 1 Samuel 19--26 of David's uncertainties, his requests of God, and the ways God answered them, and the element of trust on David's part. And Saul's schemes and plotting and his pursuit of knowledge concerning where David was - and the treacherous providers of such information - Doeg the Edomite (Doug Edom), the men of Keilah, and the Ziphites. 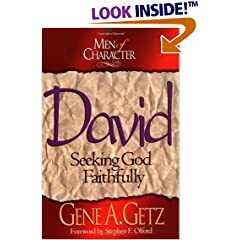 An Adult study group would find Gene Getz' book on David a good Bible Study. You might consider having a study group for staff and teachers before the VBS starts, or having an Adult or Teen class during an Evening VBS program. The Life of David by A. W. Pink - ISDN 0801070619 - is avilable through Christian Book Distributors - Stock no. 70619. and now in an online e-text as well. Some more thoughts on preparing lesson worksheets for Wanted! Worksheets are one way of provoking the children to think about each lesson. They need to be prepared with your class in mind - their ages, life situations, etc. Most VBS materials do this already - but since it is your class and you know best their needs (and since this is a "Do it yerself" curriculum) - you are encouraged to prepare these with your lessons. One page can be printed on the back of the daily Cowtown News each day which you should distribute during class. Activities are another way of generating some consideration and discussion of each days lesson. Since each lesson looks at a problem/ challenge area in life and then offers the virtues through which God enables us to overcome - these two aspects will be dealt with in your classes. There is an ongoing contrast between Saul and David in regard to the way the Man after Men's hearts and the Man after God's heart responded to the troubles in their lives. Try to relate their struggles with these matters to the struggles your children also have. Dealing with friends, bullies, parents. Coping with the violence or abuse we are constantly exposed to on the news and TV. The jealousies or anger they might feel, the decisions they are forced to make and the challenge of doing the "right thing" instead of the easy thing. The wrong choices that even David made, and how Jesus delivers us from our sins and troubles. One approach: Take a piece of paper - Draw a slash across it. On one side write each day's Trouble, then list some ways they manifests themselves in your children's lives. On the other side write the Virtue and some ways the children can use it to meet their problems. Then generate an written activity that will get the children thinking about each side of the line to fit those spaces - Fill in the blanks, crosswords, word searches, acrostics, puzzles, etc. there are all sorts of possibilities. 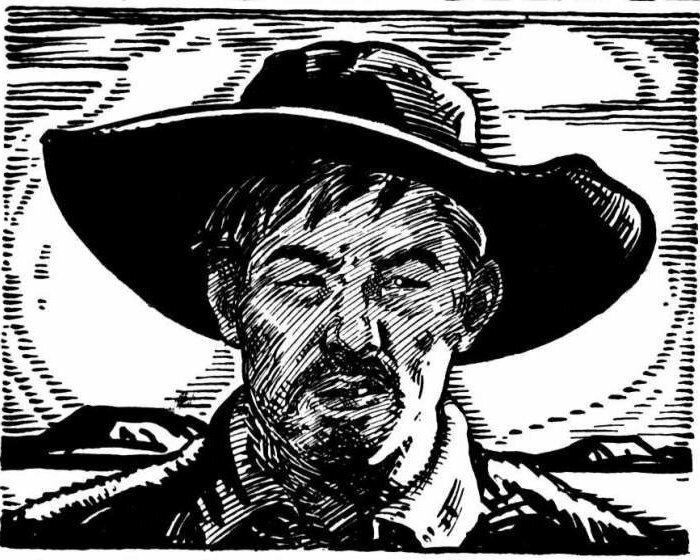 Use the western theme, if possible. For smaller children, you might want to use coloring pictures, etc. Add some western fonts and spot clip art to each page. You will note that in reading the Cowtown News together each day will give you some "springboards" for discussion both of David's troubles and of the daily themes. The Melodrama, if you use it also deals with these themes on a day by day basis. Some Brainstorming "starters" - it is after all your lesson!! Psalm 34:19 A righteous man may have many troubles but the Lord delivers him from them all. Coloring Image: Frightened young "cowboy" peeking out of his blankets in bunk, (eyes under bed and peeking out of closet;) or in his bedroll, Have children discuss or draw "imaginary" scary things that might be prowling around; Owl on cactus hooting; Coyote howling on hill at night, snakes, Indians, bad guys, etc - Discuss "What kind of scary things are in your children's "closets?"?" Coloring Image: Cowboy with fancy new duds, several admiring friends, one obviously very jealous. Activity: a "Bragging" contest! Coloring Image: A mounted and puzzled lost cowpoke and hoss scanning uncertain horizons, cow's skull, dryed up watering hole?? - Key idea here having no clear cut directions. Activities: Desert Map or Maze exercise? Present children with some situations demanding choices to be made. Coloring Image: Frontier buildings, street, and gunfighter ready to draw. Activities could include a "shootout" between teams - Ways to get even, the right things to do. Or a Bible "Quick draw" on verses related to confronting others. "How do I confront someone who is gunning for me?" Coloring Image: cowpoke behind cactus area studded with arrows, out of bullets?? - under attack. Activities: Crossword of cowboy "troubles": stampede, flashflood, Indians, etc. Discuss: mistakes made that get us into real trouble!! How God can get us out! You might find some more practical help for preparation in my CE Teaching Manual: - especially in My Effective Story Telling Manual; my article: Choosing Story Teaching Methods, and Discerning the Story Structures of the Narrative Literature of the Bible. © 1999 Barry McWilliams and Chapel Hill Presbyterian Church.